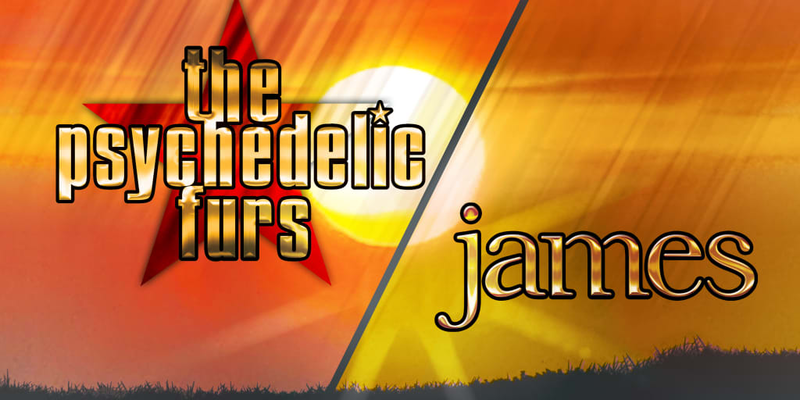 Hugely popular 80s/90s UK alternative rock acts, The Psychedelic Furs and James are touring together across the US this summer – including one amazing night in Reno’s Grand Theatre! Many of the alternative rock artists dominating today’s music pay homage to The Psychedelic Furs. Led by front man and songwriter Richard Butler, the Furs won over fans and critics alike by combining poetic lyrics, innovative rhythms, and melodies driven by an aggressive, punk desperation. Through it all, the band scored major hits with “Love My Way,” “Pretty In Pink,” “Heaven,” “The Ghost In You,” and “Heartbreak Beat”. Manchester band James were an institution on the British alternative music scene in the ’80s and ’90s. Their indie folk-pop, infused with the acid-house inspired sound of ‘Madchester’s’ baggy music scene, garnered a huge following. Hits like “Sit Down” and “Laid” are still sing-along fan favorites, while the band’s new repertoire of music – including 2018’s sensational Living in Extraordinary Times – continues to bring the big sound and big heart of James to arenas of fans around the world.